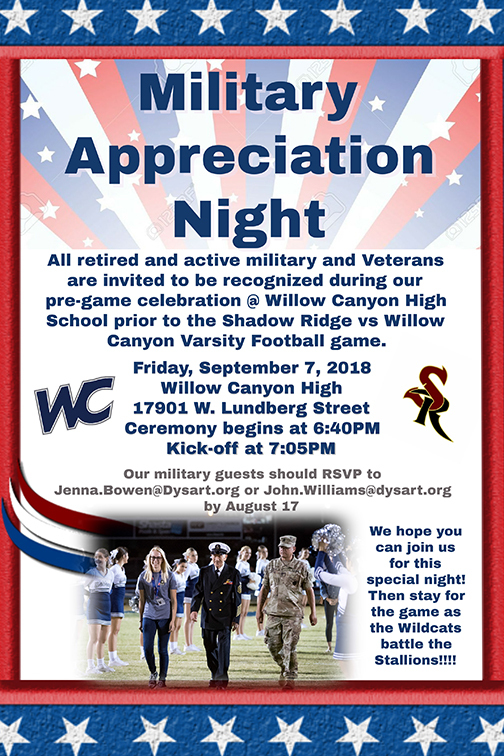 The Dysart Unified School District is hosting a Military Appreciation Night to honor veteran and active duty military members during a pre-game celebration at Willow Canyon High School, before the Shadow Ridge vs. Willow football game on Friday, Sept. 7. Take part in this free, family event! The ceremony begins at 6:40 p.m. Kick off begins at 7:05 p.m.
Military guests should reserve seats in advance to Jenna.Bowen@Dysart.org or John.Williams@Dysart.org by Aug. 17.